Film, self sealing, laboratory, thermoplastic, 2 inches x 250 feet (WxL), 50mm x 75m (WxL), highly elastic, designed for airtight and moisture-proof sealing, forms a completely tight seal even with irregular shapes and areas, interleaved with paper to prevent sticking, supplied as single roll mounted in cardboard dispenser box, colourless, semi transparent, pack of 1, Bemis, Parafilm M, PM-992. LabShop supplies the complete Parafilm M product portfolio. 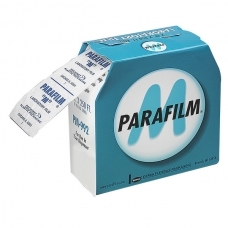 If you cannot find the specific Parafilm M item(s) you require within the LabShop web catalogue range, please contact us for price and availability.